During the Spring of 2017, she was refitted with a new sail, paint, and batteries and, on 22 April, deployed off the Research Vessel Celtic Explorer mid-Atlantic as can be seen here. The video of the launch is posted here. At the end of July 2017, after traveling another 6500+ kilometers, we saw she was headed towards the south coast of England. Mike O’Conner contacted several new agencies, listservs, local pubs, and Facebook contacts (as he had done prior to her Irish landfall) in an effort to rescue her. After reporting within a half day sail from Plymouth Harbor, she went silent for a few days and we imagined she might have crashed on the rocks somewhere and disappeared. But then, on the morning of Aug 4th, she reported from a field of anchored boats at the mouth of River Yealms near the small port of Newton Ferries!! Stay tune as we wait for more news. Thanks to our Belgium colleague, Evy Copejans, folks were contacted at Plymouth’s Marine Biological Association who, in turn, contacted the Yealm Harbour Authority and the Yacht Club but it was an article published in the local Herald and discussed at a local pub that provided the ultimate contact. After seeing it free floating in the harbor and then hearing these discussions at the pub, two patrons returned to the harbor and recovered her. See photo to the right. This is a special boat with three world-class marine science universities, a new research vessel, and a NOAA drifter involved. The boat and drifter were delivered to the RV Neil Armstrong in Woods Hole on 30 April 2016. 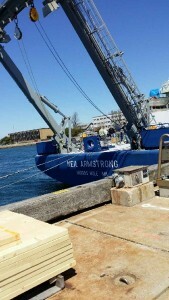 The Armstrong is UNOLS’s newest research vessel operated by the Woods Hole Oceanographic Institution. The deployments, one of the first missions to be conducted by this multi-million dollar vessel, were made on the afternoon of 7 May 2016, near the shelfedge south of Martha’s Vineyard. Drifters Away! from Woods Hole Oceanographic Inst. on Vimeo. One of the systems that has become integral for ocean research is “telepresence” – where researchers, classrooms and the general public can connect to the ship in real time via the internet. This cruise was a the test run for that telepresence for the Armstrong. The land base of operations for those cruises is URI’s Inner Space Center. Ivar Babb, the director of NURTEC at UCONN Avery Point, arranged the deployment. 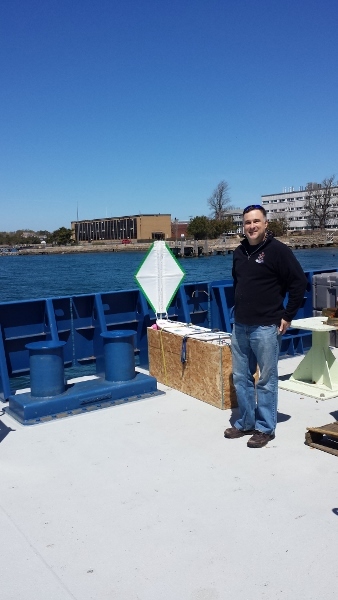 Tim Shank, the chief scientist from WHOI on the deployment cruise. Kelly Barnes is the tech coordinator at WHS and Martha Shoemaker is the 4th grade teacher involved. The boat is reporting 3 times per day at approximately 0Z, 0800Z, and 1600Z. The drifter is reported every two hours. Before getting underway, the Lancer was already getting local press here. Kaitlyn’s twitter about the project is @DrifterWhs. Later that same day, Mike and Kaitlyn also emailed the mayor of Waterford, Ireland in attempt to get him interested. The next morning, on September 7, 2016, we heard from Edna Nolan, the managing director of the Coastways Surveys in Ireland telling us they already had their eye out for the approaching boats and they happen to be working on the west coast this particular week! The Minister of Education’s secretary, Derek Newcombe, acknowledged Mike’s email. Martha Shanahan with the local press in Waterford CT reported she is already preparing for a followup story if and when Lancer lands. 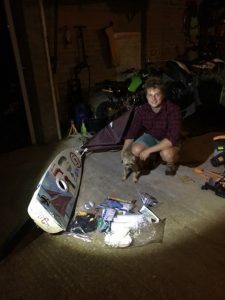 Mike sent additional emails to other Irish contacts who had been recently involved in the search and rescue of previous mini-boats this year either landing (Marlin Spike Miller, Red Storm) or coming close to Ireland (West) all with their own story to tell. We subsequently heard from Mick Sheeran from EcoMarineTours with “That’s all fine Mike. We will keep an eye out for them. We found the last one on Inish Vickillaun [ Blasket Islands, Co.Kerry] and is still in my back yard needing some TLC including new weighted keel and transmitter and glassing in deck etc. Let me know if you think they are approaching the Blaskets and would be glad to intercept before they make a rough landing again. Best Regards, Mick Sheeran aka Captain Whales Galore” but, as Mike O’Conner noted in a response, the Lancer will most likely land, if at all, further to the north. On September 8th, 2016, Mike sent a challenge to all the Waterford Ct schools in his district to predict where and when Lancer would land. Prizes will be awarded! We even heard from mini-boat enthusiast from other parts of Europe who were following the story. 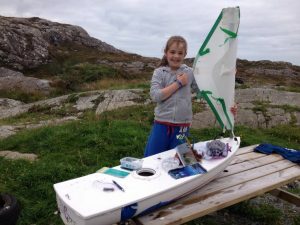 Evy Copejans, one of our marine-educator colleagues from Belgium, reached out to the National University of Ireland in Galway with: “If you have any contacts of the local coast guard/(research) vessel who can pick up a miniature sailing boat that crossed the Atlantic, please contact the school below. Many thanks for helping us retrieve this unique piece of education material!” . Luis Sebastião, from Portugal’s Institute for Systems and Robotics, sent out an similar email to nearly a hundred contacts. So, with nearly everyone on the west coast of Ireland having been alerted, we awaited to hear of little Lancer’s fate. At 1534Z, it was reported to Kaitlyn’s twitter account that Lancer has been recovered!! See photo below. See more photos, videos, and a transcript of the recovery exchanges here. Later in the day, after multiple jubilant email exchanges across the Atlantic, we heard again from Edna Nolan with “Hello Folks. Great to hear she has landed on the Coral Strand. We have surveyors working in this part of Galway next, they could pick her up and bring her to Waterford Institute of Technology https://www.wit.ie/ near our office and I’ll speak to a lecturer colleague about relaunch etc.” And so the Lancer story may continue, from one Waterford to another but, like a little ship on the high seas, you just don’t know what will happen. Hello Michael! We are delighted and very excited that we recovered the boat. 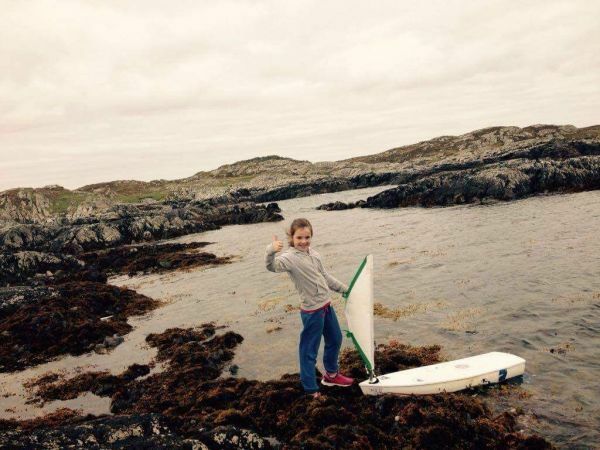 The girl who recovered the boat is my daughter Méabh Ní Ghionnáin, who is 8 years old. She can’t wait to return to school tomorrow morning (with boat in tow!) and tell her story and what a story. She is already booked for an interview with RTE Raidió na Gaeltachta our national Irish Language Radio Station tomorrow at approx 09.40 GMT. The Lancer sailed into Droim, Leitir Móir which is in Conamara, County Galway. A Gaeltacht region where our native tongue is Irish. We first heard of the Lancer’s voyage from my sister Clíona, whom Kaitlyn contacted via FB messenger last Friday. Using the drifter project link online we checked out Lancer’s location Friday night but it was still southwest of the Aran Islands. We couldn’t believe it when the gps tracker showed the sailboat literally in front of a little island that we gaze at everyday from our livingroom window! Alas we couldn’t see the boat but we discussed possible locations along the local shore that it may have sailed to. Méabh and her Dad Stiofán, walked down to a rocky shoreline east of that little island (Oileán Anamna) and there she was – a little weather beaten, having sailed through three thousand miles of storms and high seas! Méabh was beside herself opening the boat to see what surprises from across the wild Atlantic were hidden below! 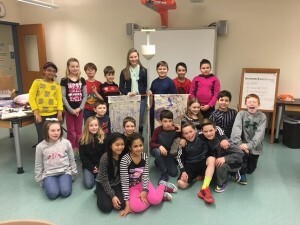 Wow, a teddy, an octopus, pencils, a t-shirt, UCONN memorabilia and the best thing a memory stick laden with treasure from the elementary students. We imagine this will be such a great project for Méabh’s class, replying to Kaitlyn and the other the students but also in re launching the Lancer and preparing her for the next leg of her exploration. We will discuss it with the her school first but I am sure they will be very interested in being involved in such an exciting project. Our family have a huge connection with the sea and with the USA! We have close family in Massachusetts and relatives in other states. Méabh’s Dad is a fisherman. Her grandfather used to fish and her great grandfather and great great grandfather were fishermen too! Her grandfather and uncles own and sail Galway Hookers – traditional wooden work boats that have survived on the Galway coast. These can be seen on my twitter account @nedstaf Yes we are ok with you using the images and I will forward more. Great to hear from you and feel free to ask us any further questions. All the best, Neasa Ní Chualáin Méabh’s Mother. +353 87 28 44 272. In January 2017, plans are underway with Mike and Kaitlyn’s families to travel to Ireland in February. Mike’s email reports: “Kaitlyn and I will be traveling to Ireland next month and she got some press about it. 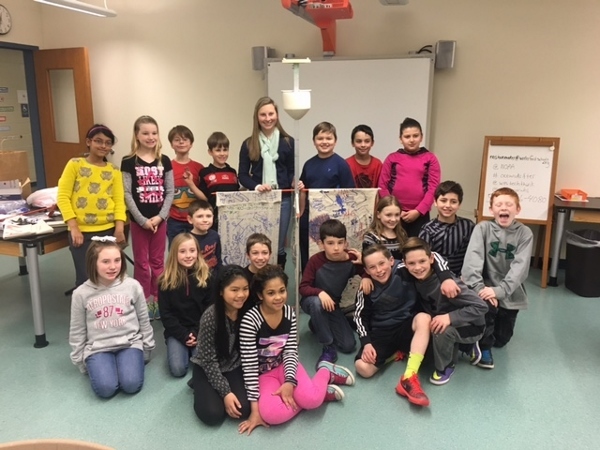 This boat was prepared by Kaitlyn and other students of Mike O’Conner’s at Waterford CT High School (WHS) in coordination with younger 4th grade students at the nearby Quaker Elementary School.